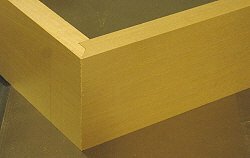 A mitered rabbet joint is a good choice when you want the good looks of a mitered corner, but with the added strength and self-aligning properties of the rabbet joint. I use it mainly for decorative boxes or small drawers for side tables etc., and when further reinforced with dowels or corner splines, many other uses are possible for this attractive woodworking joint. 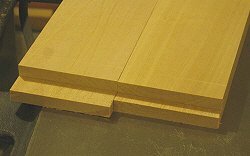 With a little practice, it's not hard to make, but it does require very accurate measurements and a table saw that is in good tune to achieve a tight fitting joint. There are only two set-ups involved, so a little extra time and care taken here will help insure that you get good results. I've detailed the steps I use to make my mitered rabbet joints below to give you an idea of what's involved. A dado blade and sacrificial fence make for accurate rabbet cuts. To keep things as simple as possible, I use half the thickness of the workpiece for the depth of the rabbet cuts. This makes a nice uniform mitered rabbet joint with plenty of support at the rabbet and also where the mitered ends meet. On 3/4" material like I'm using here, the depth is 3/8". The width of the rabbet on one mating piece is 3/4" and on the other 3/8". These measurements must be taken into consideration when sizing your drawer, box or whatever it is you're building. To cut the rabbets, I set up my dado blade set at 13/16" wide and attached my sacrificial fence to the table saw's rip fence. I've left 3/4" of the dado blade exposed from the face of the fence to cut the widest rabbet first. The dado height is set at 3/8". 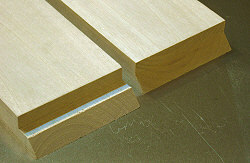 On this 3/4" material, one rabbet is 3/8" deep by 3/4" wide and the other is 3/8" deep by 3/8" wide. I've also added an mdf fence to the miter gauge, with the right end of the fence just touching the blade. This will help prevent any tearout on the back edge of the workpiece as it goes past the blade. Make sure your miter gauge fence is set at a perfect 90 degrees to the miter slot. With everything set up and double checked, a 3/8" x 3/4" rabbet is cut in the first workpiece. The fence is then moved over the dado blade some more so that only 3/8" is exposed and a rabbet is cut in the second workpiece. 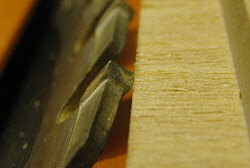 The blade is set to the bottom of the rabbet on the workpiece. With the dado removed and a single blade installed, the angle of the blade is set to 45 degrees. It's a good idea to use your best crosscutting blade here to get the cleanest cut possible. Bring the workpiece with the shortest dado up to the blade and raise the blade until the edge of a tooth is even with the bottom of the dado cut. Rotate the blade back and forth to find it's highest point. If you're using an ATB (alternating top bevel) type blade, make sure you pick a tooth that has the bevel sloping away from the workpiece. Cut the miter on the workpiece with the narrowest dado first. With your workpiece against the fence on the miter gauge, make a cut about 1/16" away from the dado's shoulder and then sneak up on the shoulder with the next cuts. You want a nice clean line where the miter meets the shoulder, so take your time and take as many cuts as you need to get this right. Raise the blade slightly when cutting the miter on the workpiece with the widest dado, just enough for the teeth to clear the bottom of the dado and prevent the blade from tearing the cross grain. The finished mitered rabbet joint. You want to cut the miter so that it leaves a 3/8" by 3/8" dado in the workpiece that will match up to the other workpiece. I like to sneak up on this cut too, checking it against the other workpiece after each cut to see how much is left to remove. That's all there is to cutting a mitered rabbet on the table saw. Like I said earlier though, your table saw needs to be properly aligned and your miter gauge square to the miter slot to get decent results. Once you get a bit of practical experience with this joint, you'll probably find many uses for it. 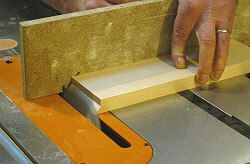 It's much easier to glue and clamp than a simple miter because it tends to hold itself square. Use a sacrificial fence to cut perfect rabbets with a dado blade. Learn more about rabbet joints. Setting up and adjusting a stacked dado set.